There are two types of digital graphics files – vector and raster. 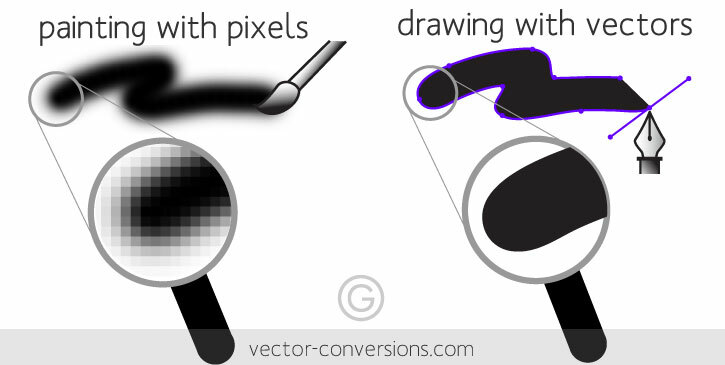 Vector images are made of hundreds of thousands of tiny lines and curves (or paths) to create an image. Raster images are composed of pixels. Vector graphics are comprised of lines and curves called as paths. Each path is formed by connecting a specific point or node location on x and y axes of a vector graph. All vector graphics are created using a special computer software which represents the graphics as an intricate wireframe, in which each path/line consists of a well de ned node location, node position, length and curves. Vector logos use very formulaic, systematic approach to the drawing and can be sized and resized repeatedly without losing their resolution or looking pixilated (as with raster images). In computer graphics, a raster graphics or bitmap image is a dot matrix data structure, representing a generally rectangular grid of pixels, or points of color, viewable via a monitor, paper, or other display medium. Raster images are stored in image files with varying formats. When working with raster images and large format printing it’s always best to start with a high resolution image and build your file size for it’s intended purpose.